1892. relié. DeCollectionCommeNeuf. Hetzel, s.d.(1892). In/4 percaline éditeur au portrait collé, tranches dorées, 55 illustrations de L. Benett, dont 12 planches en chromotypographie, 2 cartes en couleurs, 285 et 199 p., 4 f. de catalogue (nouveautés 1892-1893). Exemplaire extrêmement frais hormis une coiffe inférieure légèrement amortie. Un écrit en page de garde. Biblio Philippe Jauzac p. 267. Boston: Estes and Lauriat,, 1892. 30 volumes, octavo. Recent light brown crushed half morocco, raised bands forming compartments to spine ruled in gilt, titles direct to second and third gilt, others with foliate cornerpieces and central arabesque devices gilt with circular green morocco onlays, marbled sides ruled in gilt, top edges gilt, others untrimmed. Vignette title-pages printed in red and black, 200 plates with captioned tissue guards. A fine set. 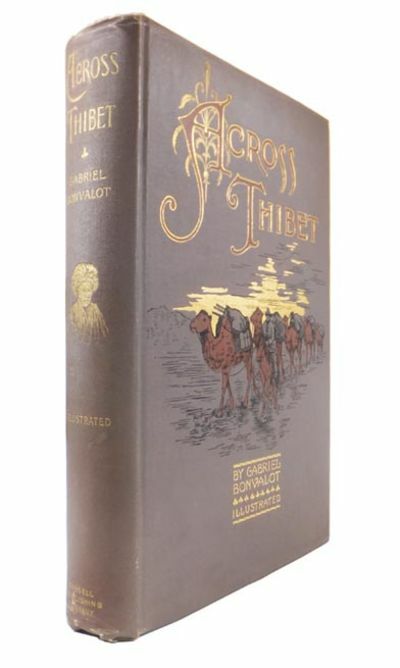 Limited edition, numbered 148 of 500 sets printed on Holland paper, translated into English by Alexandre Baillot and with two volumes of biography by Alfred Barbou (1846-1907). New York and Chicago: F. T. Neely, Publisher,. . original decorated red cloth, front panel stamped in gold and blind, spine panel stamped in gold, rear panel stamped in blind, decorated endpapers with floral pattern printed in olive-green.. Touch of wear at spine ends and corner tips, cloth dust soiled, De. Foe's bookplate on front paste-down, a very good copy of a scarce. book that is rarely found in nice condition. (#149996). First edition. Presentation copy with signed inscription by Granville to "my friend" Louis V. De Foe on copyright page. "A doctor-scientist and his faithful bushman companion discover a new race in an Australian desert - a cross between a lost tribe of bushmen and some pugnacious kangaroos! These four- foot balls are ruled by a white woman who had been stranded among them as a child. Like Twain's Hank Morgan, the doctor revolutionizes the native culture with mechanical wonders. The final result is a technologically sophisticated land where governments, judges, lawyers, and police are unnecessary because of the new morality inspired by the doctor's explosives and ideals." - Roemer, The Obsolete Necessity, p. 193. Bleiler, Science-Fiction: The Early Years 909. Clareson, Science Fiction in America, 1870s-1930s 349. Locke, A Spectrum of Fantasy, p. 94. Suvin, Victorian Science Fiction in the UK, pp. 51-2. Bleiler (1978), p. 85. Reginald 06243. Wright (III) 2243. Not in Lewis, Negley or Sargent. London and New York: Macmillan and Co, 1892. n. Hardcover. 159 x 105 mm (6 1/4 x 4 1/8"). xxii, 238 pp. Edited by William Watson. LOVELY CONTEMPORARY BLUE-GRAY CRUSHED MOROCCO, ELEGANTLY AND ELABORATELY GILT, BY BUMPUS (stamp-signed on front turn-in), covers with delicate filigree frame and large, densely intricate central medallion composed of hundreds of small tools, fan-shaped cornerpieces of similar design, raised bands, spine gilt in compartments with central medallion and scrolling cornerpieces, pastedowns framed by turquoise morocco with gilt filigree borders, fleuron cornerpieces, and alternating dot and crescent tools along the four sides, ivory silk endleaves, all edges gilt. With title page vignette. Front pastedown with engraved bookplate of Victoria Sackville-West (see below). Spine sunned to a pleasant slightly darker blue-green, joints with just a hint of wear, light offsetting to free endleaves from turn-ins (as usual), isolated corner creases, other trivial imperfections, but a most attractive little book, especially smooth and clean internally, and in a flamboyant binding showing almost no wear. This is a romantic book in terms of its contents, a fine piece of work in terms of its binding, and an intriguing object in terms of its special provenance. The text comprises a collection of 206 love poems ranging from old anonymous ballads to sonnets by the titans of English literature. The editor, poet and literary critic William Watson (1858-1935) has arranged these thematically into "Love's Tragedies," "Romance of Love," "Love's Philosophy," "Love and Nature," "Chivalric Love," "Love's Divine Comedy," "The Wings of Eros," and "Love with Many Lyres." The binding, signed "J. Bumpus, 350 Oxford St.," is typical of the well-executed, quite pleasing, and generally undervalued work produced under the Bumpus name for a substantial period, beginning in the latter part of the 19th century. Packer says that the Bumpus bindings were done at the premises of the bookselling firm of John and Edward Bumpus, which was founded in 1780, and he suggests that the Oxford Street address appearing in our volume was the bindery's long-standing location, encompassing the Victorian period and beyond. The filigree work on the covers is extremely delicate and complex, and no doubt took many hours and great skill to execute. Our former owner, Victoria Sackville-West (1862-1936), best known as the mother of writer Vita Sackville-West, was a fascinating woman in her own right. The illegitimate daughter of diplomat Lionel Sackville Sackville-West, second Baron Sackville, and his long-time mistress, Spanish dancer Josefa de la Oliva, Victoria was born in Paris, travelled widely in Europe, and later accompanied her father to his posting in Washington, D.C. On their return to London, she was accepted by British society and married her first cousin, Lionel Edward Sackville-West, who subsequently inherited her father's title and the family estate of Knole. A cultured and intelligent woman, Victoria was the great friend of Sir John Murry Scott, secretary to Sir Richard Wallace and residual legatee of the famed Wallace art collection. He left most of his estate--more than $6,000,000--to Victoria, a decision the courts upheld over the objections of Scott's family. Someone, probably Victoria herself, has pencilled a cross beside a title in the table of contents, a poem by ancestor Charles Sackville, Earl of Dorset. Griffith, Farran & Co, 1892. Hardcover. Used; Good. Hardcover; English language; No jacket; 12mo - over 6.75" - 7.75" tall; good condition. Your book will be securely packed and promptly dispatched from our UK warehouse. All international orders are sent Royal Mail airmail. KAI GA CHO, KAMPO, KAGETOSHI, BAIREI, YOSHIFUMI KATEI &c.: A Salute to Ancient Painters. A MARVELOUS RENDERING OF BEAUTIFUL COLOR ART IN WOODBLOCKS Tokyo  - , Okuma. Stitched stiff wrs., vol 2 of 2 vol setblocks carved by Minokichi, complete in itself, 23 doublefolded leaves [ie 46p. ], 40p. color woodblock prints, handprinted on hand made paper, 16 x 14.5 cm., very good. Color scans available for this book on request. Description content 2015Copyright Rare Oriental Books Co.
1892 - Backed, in acid free mylar envelope, slight damage to two words. New York: Cassell Publishing Company. 1892., 1892. First US edition. Octavo, pp. xiii, 417. Publisher's brown cloth with a bevelled edge. Gilt titles and portrait of a Tibetan to the spine. A evocative rendering of a camel train adorns the front cover under a decorative title. Gilt top edge, other edges untrimmed. Fold out map housed in pouch on front pastedown, in good condition but starting to split on some of the folds. Numerous illustrations throughout. Some bumping to the headcap, tail, and corners. Internally very clean, a very good copy. Cambridge, MA: The Riverside Press,, 1892. The text newly collated and revised and edited with a memoir and notes by George Edward Woodberry. 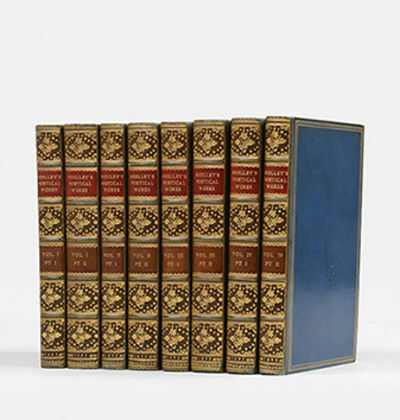 8 volumes, octavo. Contemporary full blue calf by Riviere and Son, raised bands milled gilt forming six compartments to spine, red and brown morocco labels lettered in gilt to second and fourth respectively, elaborate central fleurons and foliate cornerpieces to remaining compartments gilt, French fillet to sides gilt, inner dentelles extending over board-edges gilt, marbled endpapers, top edges gilt, others untrimmed. Engraved portrait frontispiece with tissue guard to vol. I, half-titles and title-pages printed in red and black with publisher's woodcut device to the former. Spines attractively sunned to green, light toning to edges and binder's blanks. A fine set. First Woodberry edition, large-paper issue, this set number 237 of 250 and considerably enhanced by a highly attractive binding of full calf gilt. The Riverside Press was established in Boston in 1852 by Henry Houghton, later co-founder of Houghton Mifflin. The trade issue of the Woodberry Shelley was divided into four volumes rather than eight. London: Longmans, Green & Co.,, 1892. Octavo. Original green cloth, titles to spine gilt, elaborate pictorial decorations to spine and front board gilt, all edges gilt, black endpapers. Frontispiece and numerous illustrations by H. J. Ford in text. Inked gift inscription to front free endpaper. Spine rolled, spine ends and tips a little worn, front hinge starting, rear hinge cracked but holding, contents lightly foxed. A very good copy. First edition. Andrew Lang (1844?-1912), Scottish poet, scholar and journalist, devoted most of his life to folklore and the compilation of traditional fairy stories from around the world. 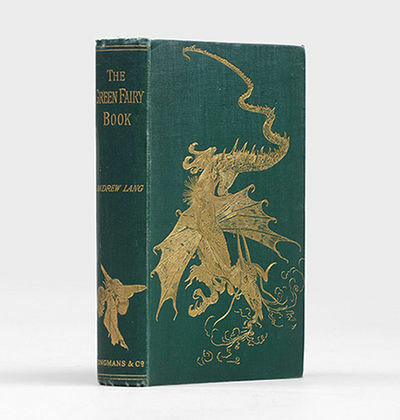 Begun in 1889, "his 'coloured' fairy books have been popular with boys and girls since their first appearance." (Osborne Collection I, pp. 34-36, and II, p. 604). Christchurch, Wellington, Dunedin, N.Z. 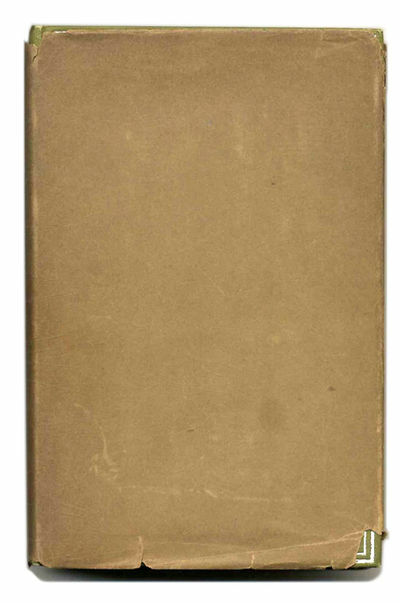 : Whitcombe & Tombs Limited, 1892, Hardback, Book Condition: Very Good, First Edition. Provenance; Manchester centrakl library bookplate to the front paste-down. Collected and bound in contemporary fine-ribbed tan cloth, very good. Gilt-blocked leather label to the spine. Bands and panel edges slightly rubbed and dust-toned as with age. Remain uncommonly well-preseved; tight, bright, clean and strong. ; 8vo 8" - 9" tall; At head of title; 'Perge et Perage'. Subjects; Monutains & Mountaineering - New Zealand - Periodicals. Mountaineering - Societies, etc. Referenced by: Index to New Zealand periodicals ISSN: 0073-5957 To 1986. Physical description; volumes : illustrations (some color), folding maps, portraits (some color) ; 24 cm. New York: Harper & Brothers. Near Fine in Very Good dust jacket. 1892. First Edition. Cloth. 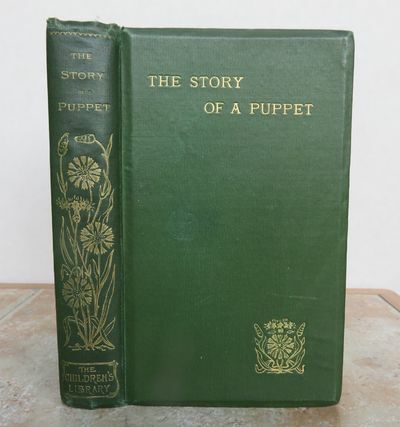 Light green cloth, titles and decoration stamped in bright silver and gilt on upper board and spine, t.e.g., in the publisher's printed paper dust-wrapper; pp. , 200. Tiniest bit of rubbing to the corners and tips, red pencil erasure to the ffep, else fine, a bright and sharp copy; the jacket is age-darkened, with chips out at the spine ends and corners . Leipzig, Verlag von Paul de Wit., 1892. 1 Titelblatt, 14 Seiten, 16 Chromolithographien Mappe 27 x 38 cm. Samtmappe mit einem Bild in der Mitte, 4 Messingbeschläge, Goldschnitt an den Seiten u. an den Blättern der Chromolithographien. 3 sprachig: Deutsch, Englisch, Französisch. Die Samtmappe ist etwas verblasst und hat ganz kleine Fehlstellen, sonst guter Zustand, keinerlei Einträge. Paris: Ernest Kolb, 1892. Fine. Ernest Kolb, Paris 1892, 12x19.5cm, relié. 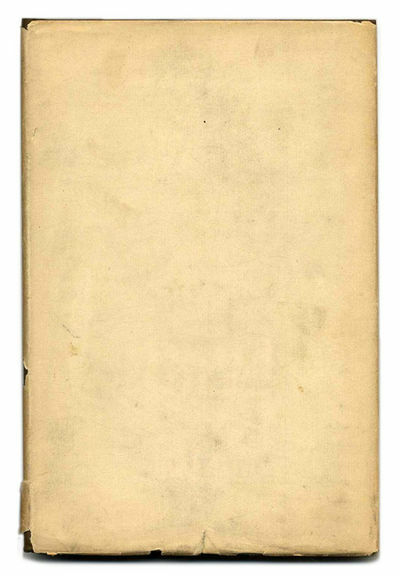 - First Edition, one of the few copies on Holland paper paper only leading copies. Binding to bradel half red calico, smooth back, part of title rubbed black morocco, wrappers preserved and bound in, binding signed Henry Joseph, typical of copies from the library Goncourt. 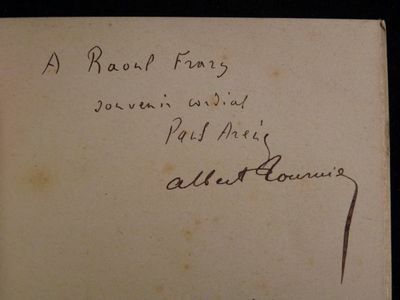 Autograph signed by the author Edmond de Goncourt: "A fervent tribute Edmond de Goncourt." 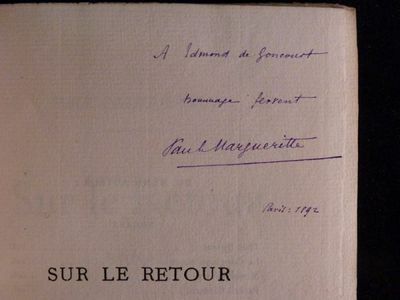 Sign up - as often - Edmond de Goncourt on the first guard: "First Edition copy on Holland paper paper.." Paul Margueritte, a member of the Académie Goncourt first naturalist and writer, is near Edmond de Goncourt. 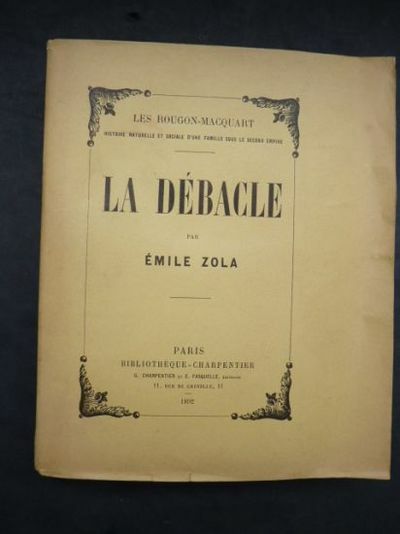 It was one of the signatories of the Manifesto of the Five Earth against Zola and one of the regulars Grenier d'Auteuil. --- Please note that the translation in english is done automatically, we apologize if the formulas are inaccurate. Contact us for any information! - [FRENCH VERSION FOLLOWS] Edition originale, un des quelques exemplaires sur papier de Hollande, seuls grands papiers. Reliure à la bradel en demi percaline rouge, dos lisse, pièce de titre de maroquin noir frottée, couvertures conservées, reliure signée de Henry-Joseph, typique des exemplaires provenant de la bibliothèque des Goncourt. Envoi autographe signé de l'auteur à Edmond de Goncourt : "A Edmond de Goncourt hommage fervent." Inscription - comme souvent - d'Edmond de Goncourt sur la première garde : "Edition originale. Exemplaire sur papier de Hollande." Paul Margueritte, membre de la première Académie des Goncourt et écrivain naturaliste, est un proche d'Edmond de Goncourt. Il a été l'un des signataires du Manifeste des Cinq contre La Terre de Zola et l'un des habitués du Grenier d'Auteuil. London: David Nutt,, 1892. Large octavo. Original cream-coloured boards, spine and front cover lettered in gilt, top edge brown, untrimmed. Housed in a custom made marbled paper slipcase. Title page printed in red & black, frontispiece and 7 plates in two states, 36 illustrations in the text, 29 decorated initials, by John D. Batten. Photogravure bookplate on front free endpaper of F. E. Dinshaw (d.1936), one of pre-partition India's most prominent businessmen and lawyers (neat library accession label on front pastedown). Spine lightly toned, some discolouration and a few creases to binding, a few blue marks to tissue guards of frontispieces, one or two marks internally. First and limited edition, one of 160 numbered large paper copies signed by the publisher and printed on Japanese vellum. 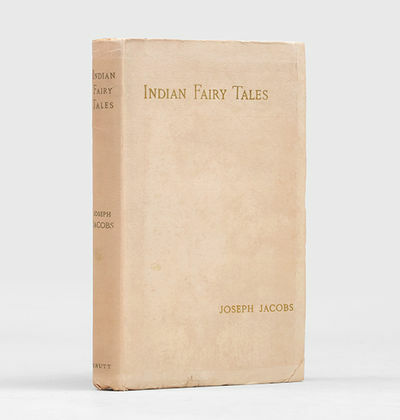 Joseph Jacobs (1854-1916), historian and folklorist, produced a number of fairy tale books in the 90s, following his marriage and the birth of three children: "perhaps it was the presence of young children that encouraged the scholarly Jacobs to turn his attention to the world of folklore and fairy tales" (ODNB). The illustrations are by John D. Batten (1860-1932), "probably the best of that group of illustrators who took mythology as the keynote for their work" (Simon Houfe, The Dictionary of 19th Century British Book Illustrators and Caricaturists, 1998, p. 56). London: Chatto & Windus, 1892. FIRST EDITIONS n. Hardcover. 184 x 127 mm (7 1/4 x 5"). Two separately issued (though obviously companion) volumes. FIRST EDITIONS. VERY PLEASING BLACK MOROCCO, TASTEFULLY GILT, BY C. & C. MCLEISH (stamp-signed on rear turn-ins), covers with gilt rule border and cornerpieces of gilt lilies against a mist of gilt dots, raised bands, each spine compartment with a similar design but featuring three inlaid gray morocco lilies at center and trefoil floral ornaments at compartment extremes, all against a stippled ground, turn-ins with gilt fillets and gilt foliate tools at corners, all edges gilt. 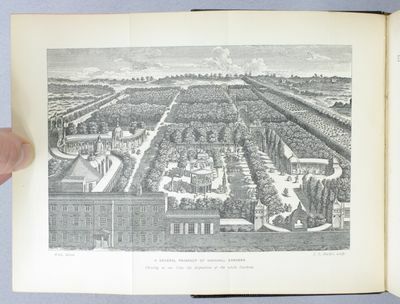 With a folding engraved frontispiece to volume I. A Large Paper Copy of each volume. A VIRTUALLY PRISTINE SET, nearly as clean and fresh as the day it left the bindery. This is a highly appealing copy of Dobson's essays, here bound by one of the most respected English binders of his (or anybody else's) time. The 32 essays printed here, all of which had appeared previously in periodical form, deal with Steele, Prior, Fielding, Hanway, Hogarth, Gray, Chesterfield, Walpole, Goldsmith, Cowper, Bewick, Richardson, Smollet, Johnson, and several others. Henry Austin Dobson (1840-1921) was a poet of lighter verse whose extensive knowledge of the 18th century led him to write full-blown biographies of Hogarth, Goldsmith, Fanny Burney, Horace Walpole, Richardson, and Steele. (He also wrote biographies of the Frenchwomen Charlotte Corday, Madame Roland, the Princesse de Lamballe, and Madame de Genlis.) Persons included are not just writers, but others of interest to bibliophiles, such as bookbinder Roger Payne. These "Vignettes" were so popular that a third series was issued in 1896, and all three went through several editions on both sides of the Atlantic. Born in 1859, our binder, Charles McLeish, was apprenticed to Andrew Grieve in Edinburgh, then came to London in 1890 to work for Riviere. When Cobden-Sanderson founded the Doves Bindery in 1893, he hired McLeish as the firm's finisher; McLeish held that estimable position until 1909, when he left to go into partnership with his son, Charles, who had apprenticed under Roger de Coverly. Although the senior McLeish was no longer in the employ of Cobden-Sanderson, all of the bindings that were signed "Doves Bindery" between 1909 and 1921 were actually done in the McLeish workshop. As can be seen here, the work produced by the McLeishes was beautifully designed and highly accomplished. Bilbao, El Mensajero del Corazón de Jesús, 1892. 4to. mayor; 578 pp. Encuadernación de la época, en media piel. London: George Newnes Ltd, 1892 and 1894., 1892. 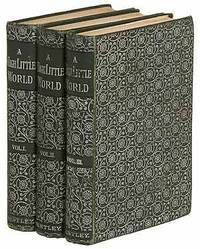 FIRST EDITIONS, earliest issue. Detective fiction; short stories. 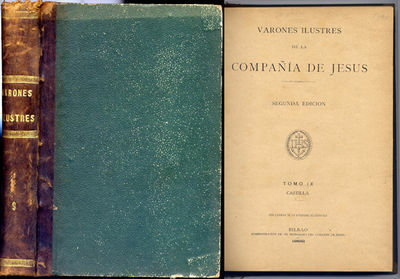 2 volumes., 4to., (I) half-title, title, pp. 317, (II) half-title, frontispiece, title, pp. 279. 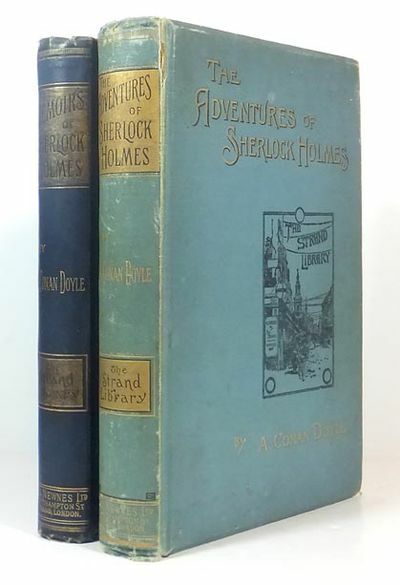 Bound in the original publisher's pale and dark blue cloths respectively. All edges gilt. A used set; joints rubbed, shows some general wear, soiling to covers, spine ends worn, paper joints cracked. Remains presentable. 'Adventures' features the misprint 'Violent Hunter' for 'Violet Hunter' p. 317 line 23 plus the earliest Street sign on the cover, whose name is omitted; later impressions bear the 'Southampton Street' wording. The classic Holmes collection. DeWaal. Green and Gibson [A10a], [A14a]. BMC No.271, 'The Great Illustrators'. Graham Greene and Dorothy Glover; Victorian Detective Fiction , , (1966). See also Cooper & Pike [p115-119], Eric Quayle; Detective Fiction, Hardwicke; Complete Guide to Sherlock Holmes (1986), Keating; Sherlock Holmes and his World (1979). London: James R. Osgood, McIlvaine & Co, 1892. 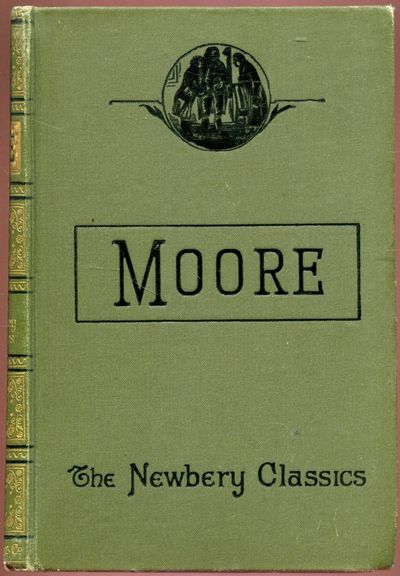 First English edition. Fine. First English edition. Two volumes. Half-title in each vol. (iv), 213p, (iii); (iv), 235p (i). Illustrated by Du Maurier with vignette title and 85 line-engraved drawings , both full-page and in the text. 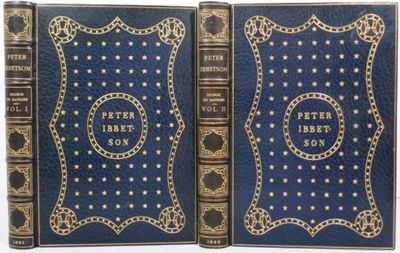 Bound by Riviere in full blue crushed morocco with marbled flyleaves, t.e.g., the spines with gilt titles and panel ornaments. the upper covers with central gilt title surrounded by a field of stars with curvilinear frame with cornerpieces, the doblures mounted with the original cloth covers and with the original spines bound in rear, the front doblure of Vol. I with gilt quotation on the dentelle. Sadleir 1674a; Wolff 1950. London: Seeley & Co. Limited, 1892.. Limited edition, no. 88 of 130 large paper copies. 4to. xvi, 422, (2) pp. Publisher's maroon morocco, gilt lettered to the spine and upper board, the latter with a gilt vignette towards the foot, top edge gilt, the others untrimmed. Frontispiece portrait and 21 illustrations, some two to a page, plus one original etching. Some light rubbing to the extremities, a very good copy. Paris: Charpentier & Fasquelle, 1892. Fine. Charpentier & Fasquelle, Paris 1892, 16x19cm, broché. - First Edition, one of 330 numbered copies on Holland paper. Beautiful copy, as published, with all margins. --- Please note that the translation in english is done automatically, we apologize if the formulas are inaccurate. Contact us for any information! - [FRENCH VERSION FOLLOWS] Edition originale, un des 330 exemplaires numérotés sur Hollande. Bel exemplaire, tel que paru, à toutes marges. Paris: Girard, 1892. Fine. Girard, Paris Février 1892 à Juillet 1893, 12x18cm pour le premier et troisième volume et 14,5x20cm pour le deuxième volume, 3 volumes reliés. 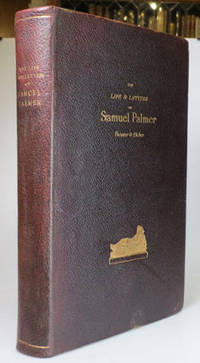 - First Edition paper supply for the first and third volume, one of the few ex on laid for the second volume. Binders black half morocco with corners, back with five bands, wrappers preserved and bound in for the first volume, golden heads. Many contributions including those Mauclair C., Saint-Pol-Roux, H. Rebell, R. de Gourmont, C. Morice, CH Hirsch, K. Boès, H. Mazel among others. Fine and rare copies pleasantly established. --- Please note that the translation in english is done automatically, we apologize if the formulas are inaccurate. Contact us for any information! - [FRENCH VERSION FOLLOWS] Edition originale sur papier courant pour le premier et troisième volume, un des rares ex sur vergé pour le deuxième volume. Reliures en demi maroquin noir à coins, dos à cinq nerfs, couvertures conservées pour le premier volume, têtes dorées. Nombreuses contributions dont celles C. Mauclair, Saint-Pol-Roux, H. Rebell, R. de Gourmont, C. Morice, C.H. Hirsch, K. Boès, H. Mazel entre autres. Beaux et rares exemplaires agréablement établis. London, T. Fisher Unwin, 1892.. FIRST EDITION IN ENGLISH 1892, DE LUXE CLOTH GILT, fourth title in Fisher Unwin's Children's Library series, small 8vo approximately 166 x 100 mm, 6½ x 4 inches, illustrated half-title printed red and black, frontispiece misplaced following title page, title page printed red and black, about 40 black and white text illustrations by Mazzanti, mostly as pictorial head- and tailpieces, pages: (6), 1-232, bound in the original publisher's de luxe binding: fine ribbed dark green cloth, bevelled edges to covers, gilt title to upper cover with small floral ornament in lower outer corner, gilt title to spine with large gilt floral decoration below it, top edges gilt, the others uncut, light brown patterned cream endpapers. Gilt on spine slightly dull, a touch of wear to head of spine, 2 small almost invisible stains to upper cover, free endpapers lightly browned, neat inscription dated 1899 and small blind original bookseller's stamp on front endpaper, very small pale mark to 4 margins, 1 inner joint slightly cracked, binding tight and firm. A very good clean copy (frontispiece misplaced as noted). The story was first published in Italy in instalments in Il Giornale dei Bambini, a children's magazine, from July 7, 1881 to January 1883 and first published in book form in Florence in 1883. 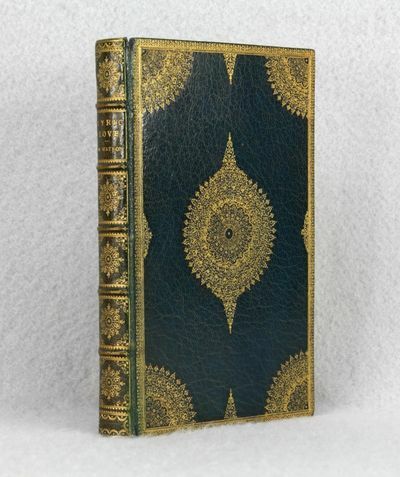 This de luxe cloth gilt edition is quite scarce, much more commonly found is the blue patterned white cloth trade edition. MORE IMAGES ATTACHED TO THIS LISTING, ALL ZOOMABLE, FURTHER IMAGES ON REQUEST. POSTAGE AT COST. Boston: Dana Estes & Company, 1892. 1st Edition . Three-Quarter Leather. Fair. 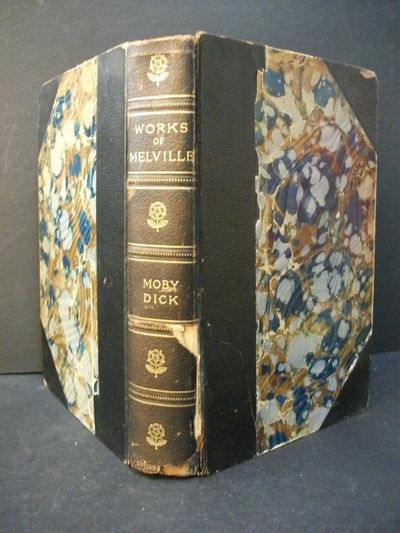 Three quarter leather bound first edition, with marbled boards. Bottom third of the leather spine is separating from the cover, repairable. Head of spine is chipped. Deckled pages, gold top-stain to edge, gold tooling to spine. Contains five etchings by W.H. Overend. Text is clean, binding secure. Questions welcome. We ship internationally from the United States and Canada every week. If buying internationally, please be aware that additional charges may apply for heavier books. We guarantee a safe, quick, and secure transaction. 10+ years in online bookselling experience. London: David Nutt,, 1892. Large octavo. Original cream-coloured boards, spine and front cover lettered in brown, top edges gilt, untrimmed. 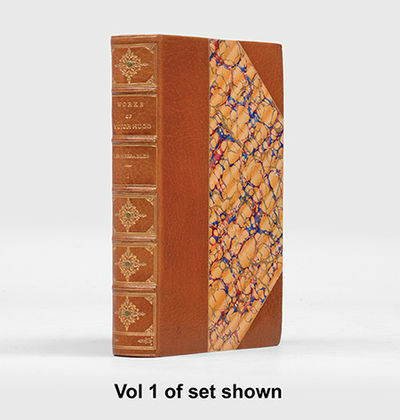 Housed in a custom made marbled paper slipcase. Title page printed in red & black, frontispiece and 7 plates in two states, 38 illustrations in the text, 26 decorated initials, by John D. Batten. Spine lightly toned. An exceptional copy. First and limited edition, one of 125 numbered large paper copies signed by the publisher and printed on Japanese vellum. 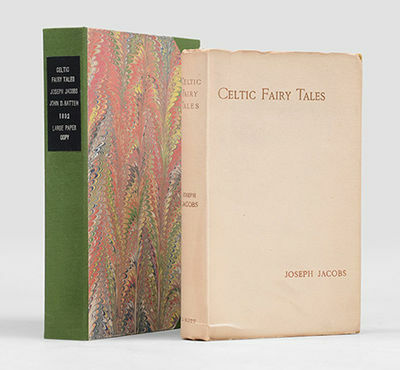 Joseph Jacobs (1854-1916), historian and folklorist, produced a number of fairy tale books in the 90s, following his marriage and the birth of three children: "perhaps it was the presence of young children that encouraged the scholarly Jacobs to turn his attention to the world of folklore and fairy tales" (ODNB). The illustrations are by John D. Batten (1860-1932), "probably the best of that group of illustrators who took mythology as the keynote for their work" (Simon Houfe, The Dictionary of 19th Century British Book Illustrators and Caricaturists, 1998, p. 56). Paris: Essais d'art libre, 1892. Fine. Essais d'art libre, Paris Août 1892- Janvier 1893, 14x19,5cm, 5 volume reliés en 1. - first edition on paper courant.binding half percaline indigo, smooth back, as part shagreen cherry, marbled paper boards, blankets stored for individual parts, corners bumped, snags without gaps on tranches.Contributions R. de Gourmont PN Roinard, CH Hirsch, J. Dolent, GA Aurier, C. Mauclair, K. Boès, Y. Rambosson, C. Morice ... Pleasant inner state. --- Please note that the translation in english is done automatically, we apologize if the formulas are inaccurate. Contact us for any information! - [FRENCH VERSION FOLLOWS] Edition originale sur papier courant. Reliure en demi percaline indigo, dos lisse, pièce de titre de chagrin cerise, plats de papier marbré, couvertures conservées pour chacun des fascicules, coins émoussés, accrocs sans manques sur les tranches. Contributions de R. de Gourmont, P.N. Roinard, C.H. Hirsch, J. Dolent, G.A. Aurier, C. Mauclair, K. Boès, Y. Rambosson, C. Morice... Agréable état intérieur. Hung Lou Meng. or, The Dream of the Red Chamber; a Chinese Novel. Translated by H. B. Joly, 1892-1893. Original Binding. Philadelphia: J. B. Lippincott. Fine in Very Good dust jacket. 1892. First Edition. Cloth. Original brown cloth, titles in gilt on upper board, top edges gilt, others deckle, in publisher's plain paper dust-wrapper; Book is fine with pages unopened; the jacket is soiled, with chips and chunks out at the spine; The letters of Dr. Benjamin Rush to his wife Julia Stockton Rush during the 1793 Yellow Fever Epidemic in Philadelphia. (Cordasco 90-7724) . 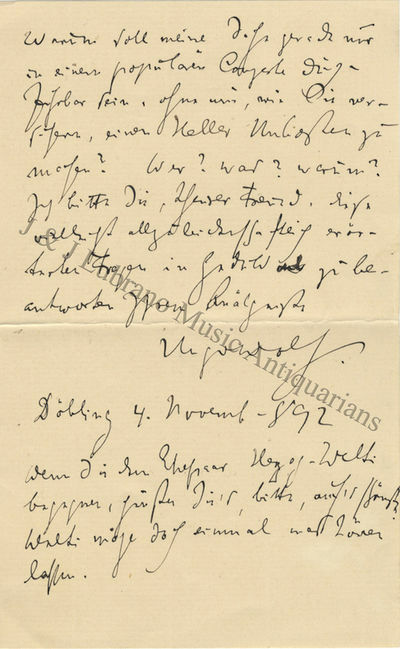 "Would you please, most esteemed [Sir], be so kind as to reveal to me the character of the so-called popular concerts in Berlin?... Are your popular concerts such at which [the audience] is eating, drinking, and smoking? Of course such concerts would prohibit the performance of vocal music, and when you proposed a popular concert to me, you intended to perform my instrumental works only. In such a case a popular concert would not serve me well because, as you know, my specialty is vocal music. However, should it be otherwise and should the said concerts also include vocal music then I would of course prefer such a popular concert to one at the Singakademie, if only to save money. It also would appear that these popular concerts are held in the hall of the Philharmonic, which should not be underestimated." Creased at horizontal fold; short split to lower portion of central fold. . "[Wolf] intensified the expressive vocabulary of the lied by means of extended tonality and post-Wagnerian declamation while retaining the defining elements of the song tradition he had inherited from Schubert and Schumann. Profoundly responsive to poetry, he incorporated detailed readings of his chosen poems in the compositional decisions he made about every aspect of song: harmonic nuances, tonal form, melodic design, vocal declamation, pianistic texture, the relationship of voice to piano, etc. Seeking an art Â‘written with bloodÂ’, he went below the surface of poetry Â– even where his musical purposes were inevitably distinct from the poet's Â– in order to recreate it in music of remarkable intensity, written, as he once proclaimed, for epicures, not amateurs." Eric Sams and Susan Youens in Grove Music Online. Richard Sternfeld (1858-1924) was a prominent arts administrator in Berlin at the time. A board member of the Wagner-Verein, he organized several performances of Wolf's works. The Berlin concert Wolf was planning at the time finally took place on January 8, 1894Â—but not as a Â“popularÂ” concert. Siegfried Ochs, director of the Philharmonischer Chor, conducted some of WolfÂ’s choral-orchestral works. 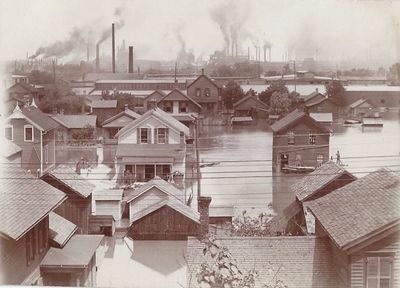 Illinois, 1892-1925. Hardcover. Very Good+. Two volumes: (1) Cloth-backed heavy boards (oblong, approx. 13 x 9 inches); with 10 heavy cardstock leaves, with mounted sepia albumen photographs ranging in size from 4-by-6 to 8-by-6 inches. 12 photographs in all, neatly labelled by hand in the margins. With additional photographs laid-in. Binding a bit utilitarian; or, it ain't pretty, but it's sure sturdy. Boards lightly soiled, bumped along the edges. (2) Cloth-backed marbled paper boards (oblong, approx. 11 x 8 inches); 23 grey heavy cardstock leaves, each with b/w and sepia photographs (albumen prints, silver gelatin prints) mounted on the recto. Photographs are in a range of sizes, many accompanied by handwritten labels -- 45 photographs total, and all are in excellent condition. Huverstuhl's signature on front paste-down, dated 1865, Chicago. Boards a little bumped and scuffed. A nice portrait of a family, as well as a portrait of Joliet and Peoria, Illinois. Frederick William Huverstuhl (b. Prussia/Germany 1847 - d. 1928, Joliet, IL) was a marble cutter by trade, and the images presented here as so nicely composed, exposed, and printed, that one wonders if photography was another of his artistic pursuits. These albums offer images of his art work and his family, as well as street scenes and landscapes -- including numerous shots of the 1902 Joliet flood and the Flood Control Channel construction in Lockport, IL -- and images from the 1893 Chicago World's Fair. The construction of the flood control channel was of particular interest to Huverstuhl, who took numerous pictures of the excavation, the work site, and the cranes dominating the landscape. 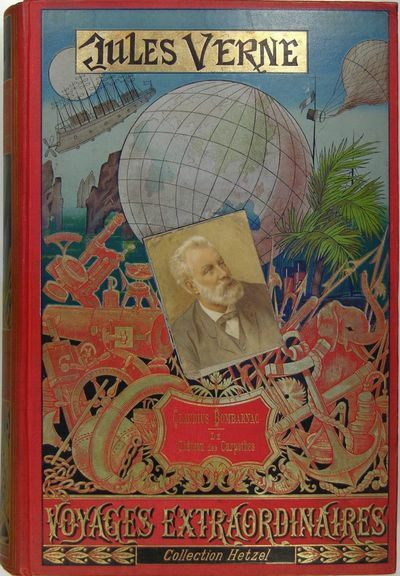 Paris: Marpon & Flammarion, 1892. Fine. Marpon & Flammarion, Paris s.d. (1892), 11,5x19cm, relié. - Edition on current paper. Bound in half morocco orange wedge, back with five nerves set with black nets, date tail, flat marbled, endpapers and contreplats paper bowl, cover and spine preserved, gilded head, binding signed Lavaux. Autograph signed Paul Arena enriched signature A. Tournier. Book adorned with illustrations in and Inserts. Few minor foxing. Beautiful copy pleasantly established. --- Please note that the translation in english is done automatically, we apologize if the formulas are inaccurate. Contact us for any information! - [FRENCH VERSION FOLLOWS] Edition originale sur papier courant. Reliure en demi maroquin orange à coins, dos à cinq nerfs sertis de filets noirs, date en queue, plats de papier marbré, gardes et contreplats de papier à la cuve, couvertures et dos conservés, tête dorée, reliure signée de Lavaux. Envoi autographe signé de Paul Arène enrichi de la signature de A. Tournier. Ouvrage orné d'illustrations in et hors-texte. Quelques petites rousseurs sans gravité. Bel exemplaire agréablement établi. London: Richard Bentley & Son, Publishers in Ordinary to Her Majesty the Queen. 1892. First. First edition. 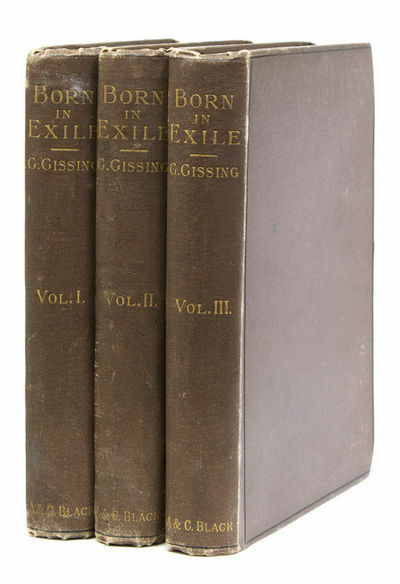 Three volumes. 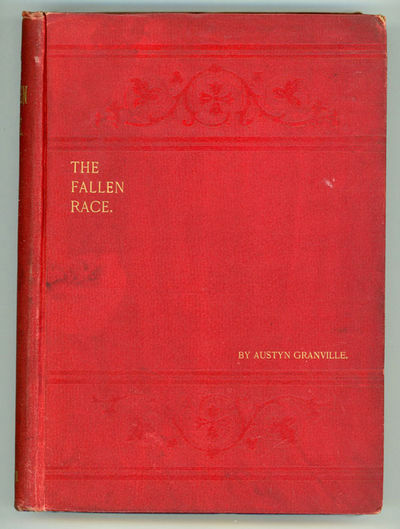 Publisher's dark-green cloth blocked on the front cover and spine with overall floral pattern in silver, lettered on the spine in silver. Early owner's signatures on the front pastedowns and free endpapers, light staining and foxing to the endpapers, rubbing to the boards and one stain to the front cover of the first volume, overall a near very good set. Published anonymously, the Bentley Private Catalogue of June 13, 1892 gives the author's real name. The daughter of a Wesleyan minister, John Fletcher, she married a minister of the United Free Church of Scotland, Robert A. Watson. A scarce set in the original publisher's binding. Wolff 7078. .
Paris: Éditions de la Porte Étroite , . Bon état général. Bon exemplaire. Couverture impeccable protégée avec jaquette protective en plastique transparente. Intérieur très propre. Exemplaire numéro 4 / 30 sur hollande créme Van Gelder Zonen. 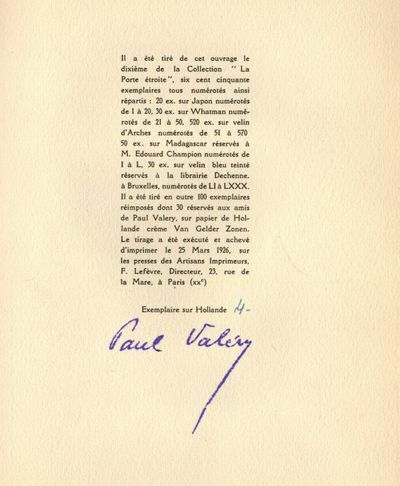 Signé par Paul Valéry. / Number 4 of 30 hand-numbered copies on Holland Van Gelder Zonen, signed by Valéry, [one of 30 reserved for friends of the author]. The entire edition consists of 650 copies. During the 25 years of his self-imposed "silence," (1892-1917) Valéry published nothing, but embarked on the massive project of the exhaustive study of the human intellect, its systems, shapes and capacities. The present remarks, which draw upon the labors of those years were offered in response to a journalist's question regarding the "crisis of the liberal professions." Extremely rare - in near fine condition. . Paris, Éditions de la Porte Étroite , 1926. 22 x 16 cm. 58 pages. Broché. / Softcover. Bon état général. Bon exemplaire. Couverture impeccable protégée avec jaquette protective en plastique transparente. Intérieur très propre. Exemplaire numéro 4 / 30 sur hollande créme Van Gelder Zonen. Signé par Paul Valéry. / Number 4 of 30 hand-numbered copies on Holland Van Gelder Zonen, signed by Valéry, [one of 30 reserved for friends of the author]. The entire edition consists of 650 copies. During the 25 years of his self-imposed "silence," (1892-1917) Valéry published nothing, but embarked on the massive project of the exhaustive study of the human intellect, its systems, shapes and capacities. The present remarks, which draw upon the labors of those years were offered in response to a journalist's question regarding the "crisis of the liberal professions." Extremely rare - in near fine condition. The Workingman's Paradise: an Australian Labour Novel. By John Miller. Oakland, Cal. Illustrated. In Photo-Gravure. From Recent Negatives.